Simply pick up the Pysc Pyro and you will first notice its great build quality then its weight. This weight provides the Pyro with an incredibly clear and bassy output for something so small! With wire-free Bluetooth and a micro SD card slot, you can play your favourite music while travelling or on a day out to the beach! The Pyro can be connected to any phone, tablet or PC with Bluetooth technology. Simply turn on the blueooth on the speaker and compatible device and it will sync, allow you to send music from across the room! You can fast forward, rewind or skip tracks via your device or using the speakers intuative switch mechanism. Don't have blueooth? Don't worry! 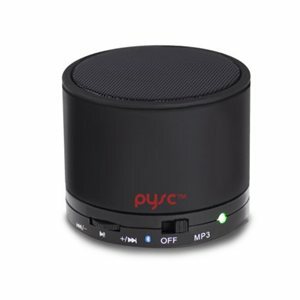 The Pysc Pyro also features a 3.5 aux jack input allowing you to connect your devices straight to the speaker! With a built-in microphone, the Pysc Pyro is more than just a speaker. 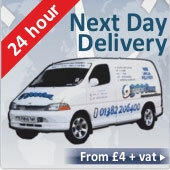 You can also receive incoming calls, turning the Pyro into a great portable handfree system with superb quality output. The Pysc Pyro boasts one of the best battery lifes we have seen from a portable speaker and even when it does run out, it can be quickly charged via the USB cable included with the speaker!